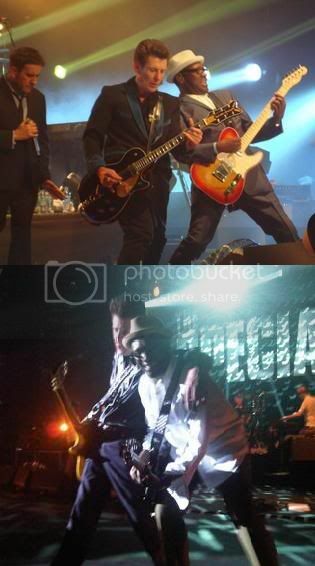 Paul Weller's intro dedicates the song to a certain 2 Tone musician. I'll let you check it out. I knew I'd heard him say this, but I thought it was on their 1982 Tube appearance. Btw, it's uncannily similar to this track by World Column. Uncannily similar is an understatement! Put it this way, they'd never get away with it now. Weller also got way with it when it comes to 'Start' and The Beatles 'Taxman'. How that one didn't end up in a court case I'll never know. Seeing as he's escaped any writs, it's not a bad idea to continue with a few more. Maybe the fact that a number of Beatles songs were also "based upon" other tunes. Would have been a case of pots and kettles, I reckon. Accused of exploiting other artists' songs in the Beatles, John Lennon defended himself by saying, "It wasn't a rip-off; it was a love-in." Paul McCartney's take: "We pinch as much from other people as they pinch from us." Full 2015 article ('Beatles' 5 Boldest Rip-Offs') is here - with examples. Martin Freeman had a "crush" on Paul Weller. The 'Ghost Stories' actor - who has children Joe, 12, and Grace, 10, with former partner Amanda Abbington - was a big fan of the Modfather's former band The Style Council, in particular their 1985 album 'Our Favourite Shop' and believes most guys have had feelings for the frontman at some point. He said: "I was a reggae nut for a couple of years but 'Our Favourite Shop' really opened me up. "From jazz and funk and soul to 60s pop - everything was on the table. "At their best, there was no one like them. There was no pop band at the time getting in the Top 10 who were that switched on and political, who were in Smash Hits talking about bringing down the Tory government. "I loved Mick Talbot's sense of humour. I loved Paul Weller's writing and I loved his hair. "I think most of us who are my persuasion have had a crush on Paul at some point, no matter how gay or straight we are." The 46-year-old actor fell in love with the "energy" of The Clash when he was just a child and even now he's still a big fan of their self-titled debut album. He told Q magazine: "It's just the perfect punk record. The music, the lyrics, it's a tremendous first album. "Not that I would have understood all of those lyrics at five years old, but I was aware that it gave you a different feeling to the Bay City Rollers or The Wombles. It's the energy of it that appeals. "Obviously, I wasn't a punk, I was a tiny child but I used to go into the bathroom and try to spike my hair up with water. "I still play it a lot and it feels completely contemporary." And when he got a little older, the music and image of The Specials became a "religion" to the 'Sherlock' star. He said: "I remember seeing the Specials doing 'Gangsters' on 'Top of the Pops' and Terry Hall freaked me out, there was something menacing about him. "But a year later, I went mad for 2 Tone. It was like a religion, my whole world was black-and-white checks for about three years. "From the opening bars of 'A Message To You Rudy', I was like, 'This is my family'. "It influenced me musically, lyrically, sartorially - all I wanted to do was look like Jerry Dammers. "I was a little kid who lived in Weybridge, I was hardly a Jamaican rude boy. But in my head, I was a rude boy." Great story, even if I had to Google Martin Freeman to see who the was. Being an Office fan, I was impressed with his musical taste! He once did a 2 hour show as a guest presenter on Radio 2 (2005 or thereabouts) where he played all those influences. Being an Office fan, . I'm sorry to hear that. Ricky Gervais is someone I could easily take a baseball bat to. Strange, hadnt heard anything about Mick Talbot for a while, then his name crops up in that interview with Martin Freeman. And have just seen that he is guesting on Roger Daltreys new album which comes out in June l believe. I have to agree. That is one of the few humans i'd like to see up against the wall come the revolution. Any time I see him on the box I reach for the remote. You're lucky. Even the sight of a mere photograph of him has me reaching for the Kalashnikov. I didn't do anything.... for some reason the forum has just removed my avatar and replaced it with this teensy, weensy, tiny one !! Weller has never hid his influences and instead chose to wear them on his sleeve, so to say. He was also trying to turn people, the youth mainly, on to different music, music he likes. When sampling really took off in the late 1980s, especially in hip hop, loads of old recordings were being used not only without permission, but without crediting the artists whose work had been used. Even though arguably it was a kind of paying homage, it was more blatant theft. Partly because of all the sampling and lack of crediting, in recent years things have swung in the opposite direction, legally. Also I think mass communication via technology has a lot to do with it. Whereas previously you could quite innocently use elements of an obscure song as a basis for your own, with the internet, nothing is really "obscure" nor off the radar. It's still a minefield - how do you show the difference between "being inspired by" and "stealing"?